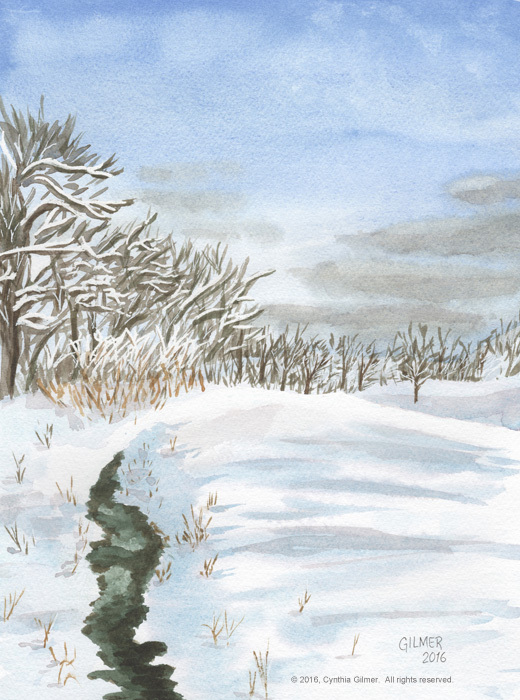 In my most recent post, just after Christmas, I shared a painting I did of a snow scene of a pond on the golf course near our home. To do this I watched a few videos on painting snow in watercolor, including this one by Grant Fuller. I think the videos were all helpful. I like the foreground including the grasses peaking up through the snow. 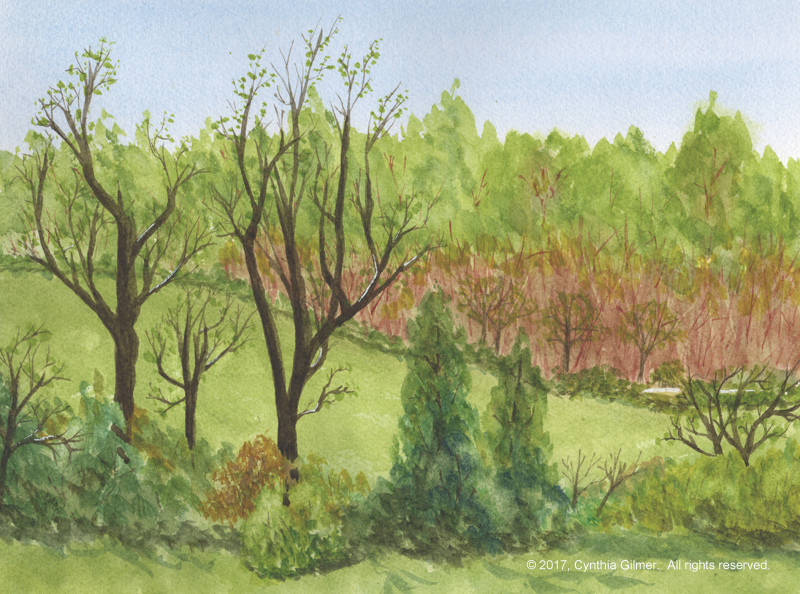 I used masking fluid to block some of the white branches in the foreground trees and one of the strongest ridges in the field. I augmented the whites with a white gel ink pen. I don’t really like the clouds. Skies look easy when I watch others do them, but I still struggle with them. Next I decided to do a scene that I’ve done multiple times in oil, hoping that familiarity would help. I’m not sure it did. Sometimes I think that watercolor is better if you’re not too tied to the original scene. Photos should really just be an inspiration. Many of the videos I’ve watched, including several by Steven Cronin like this one are done entirely from the artist’s imagination. I’m definitely not there yet! 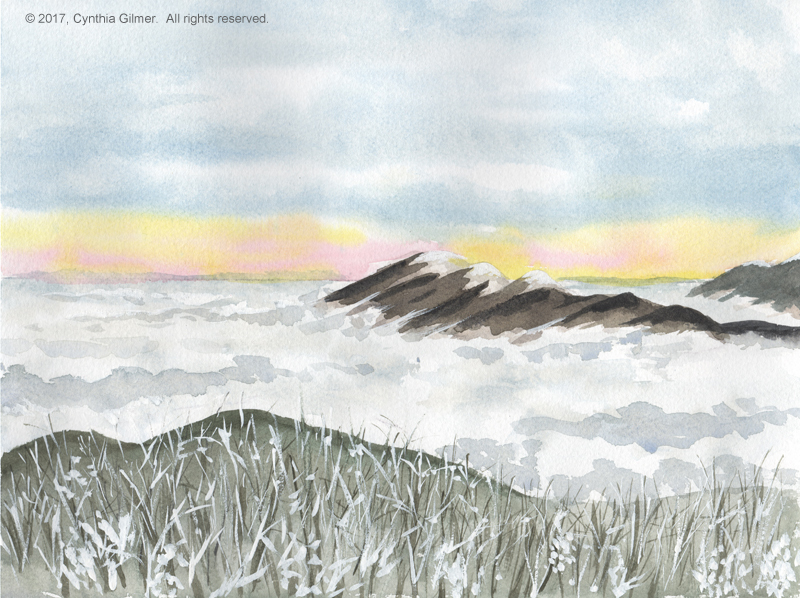 In this painting, I like the sky, but not the way the clouds are laying in the valley. I think the foreground trees turned out okay. I augmented them with my white gel ink pen. For what it’s worth, this painting looks better in the original form. The scan didn’t do it justice. 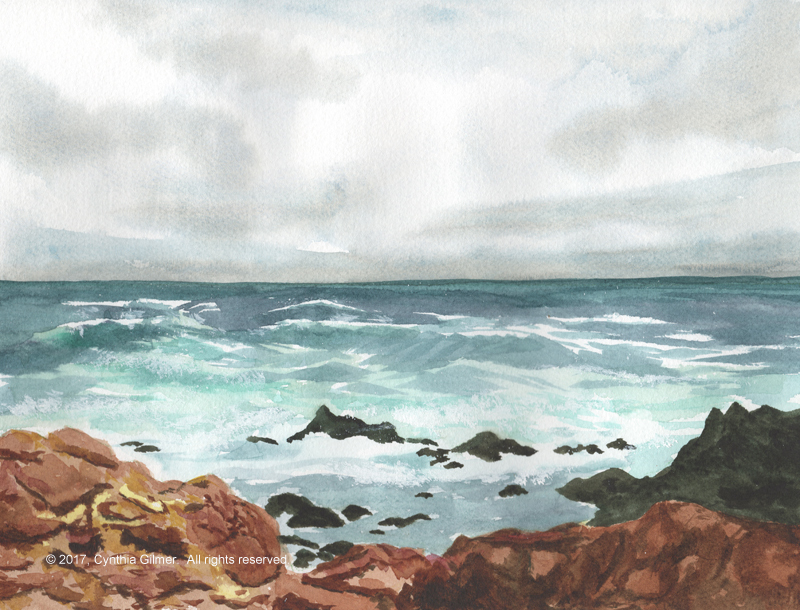 Then I decided to do a seascape, which was an ambitious undertaking. I have done very few of these, even in oil. When I was showing my work at the Farmers’ Market in December, one of the other artists, Rajendra KC was quite taken with the oil version of this scene (in my gallery if you are interested). Given that he is a very talented local artist, I was quite flattered by this. I decided to try to do a watercolor version. I have to say, I surprised myself with this one. I had very low expectations but it came out very nice. This is perhaps my best sky so far. I did not mask the white caps. I used discipline (a challenge for me) to leave them white. (I did watch part of a video that showed this, but I didn’t capture the link.) I augmented the white caps with white gouache in places, which is how I got the look of spray. I also really enjoyed doing the rocks. I took my time, starting with washes for the lighter ones on the left and then slowly layering on shadows. Then I discovered Steve Mitchell’s YouTube channel. I was quite taken with his landscapes and found his approach to be more valuable, from an instruction perspective, than many of the others. I watched several of his videos, but I thought this one on “accidental painting” would be fun to try. My version did not turn out nearly as nice as his, but it was a good learning experience. It also forced me to paint from my head, although I will confess that I allowed myself to be pulled in the direction of Steve’s example. There are a lot of things I don’t like about this painting, but given that it was a quick study it’s also not bad. 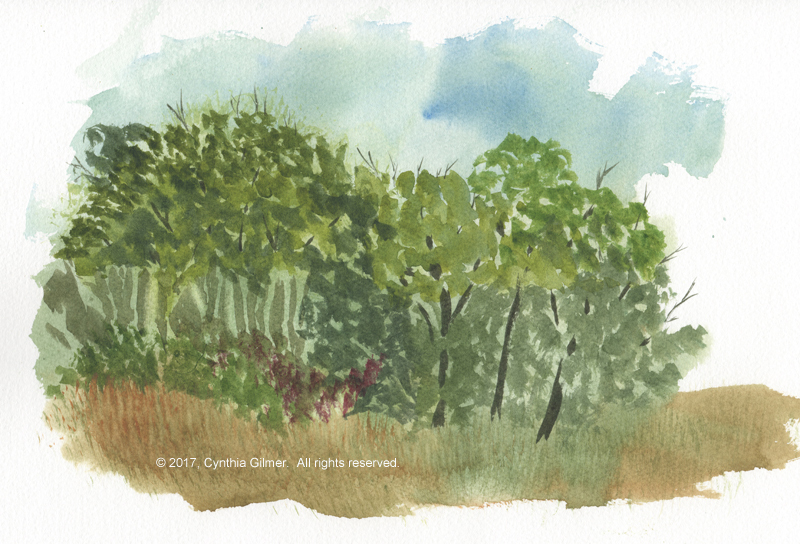 Inspired by my clump of trees study I decided to take on a painting from a photo I took of a field near Lovingston Virginia last spring. I had a lot of fun with this one, and most of it I like. There are some things I might do differently if I did it again. Rather than pointing those out I think I’ll leave it as an exercise for the reader. 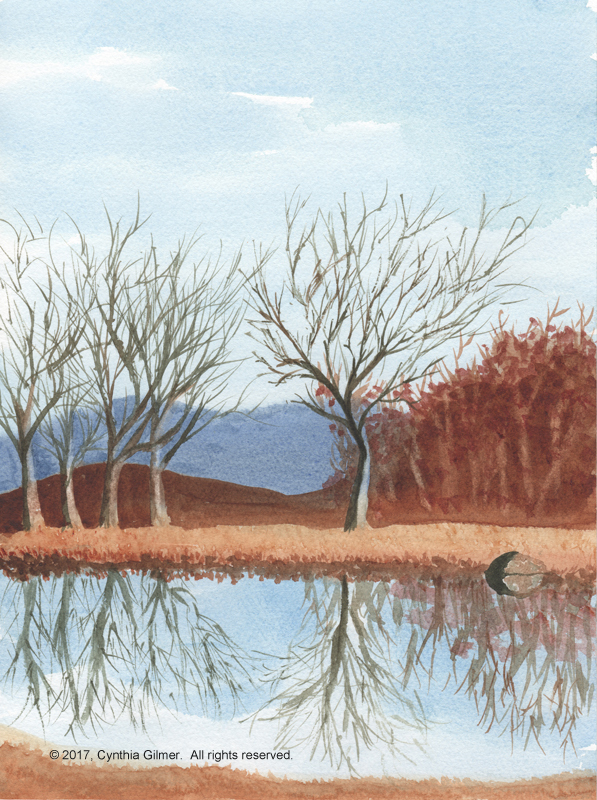 Finally, on the morning of the day we were to leave to come back to Northern Virginia I decided to do one last painting. I had limited time so I did this fairly quickly, but I think it turned out okay. I like the sky and the shoreline of the pond – especially the rock! I’m not crazy about the mid-ground trees or the reflections of the trees in the water, which I did quickly because I was running out of time. All in all, I think I made progress. I’ve continued to watch videos and I have several more techniques I’m excited to try as soon as I’ve completed this post. Practice makes perfect – of course there is no perfect in art, but practice is a way to aspire to perfection.